Thanks to everyone who donated to Rochford Street Review over the past few days. Despite all your help we are still about $50 short of covering our January costs (which include all our Word Press subscription fees and our domain registration). So to try and cover this gap we will be reminding you of some of he Rochford Street Press titles that are currently available. By purchasing any of the titles showcased over the next few days you will be helping Rochford Street Review, the Rochford Street Press Chapbook program and, for the chapbooks, the writers themselves. First off the blocks – The Selected Your Friendly Fascist edited by Rae Desmond Jones. 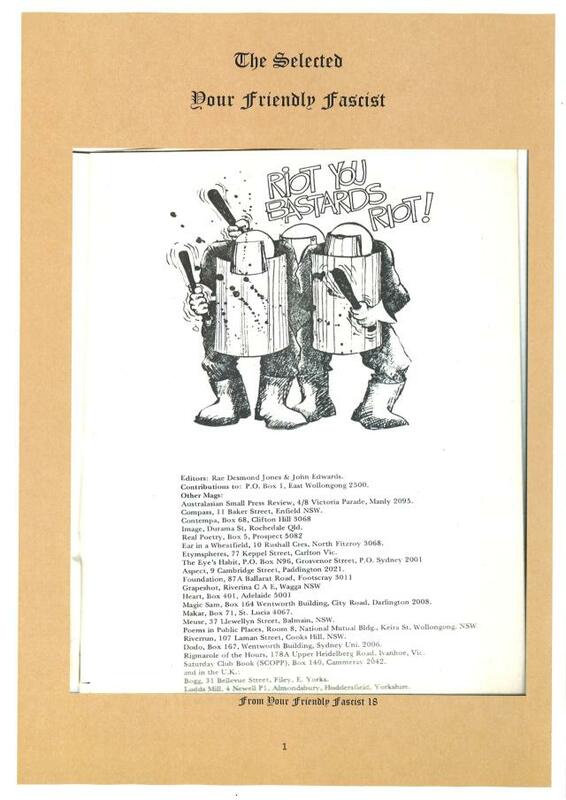 You can read more about the history of YFF at “Lots of energy here, not much control”: Your Friendly Fascist – 1970 – 1984. Rae Desmond Jones remembers…..